In the process of raising funds for the artificial turf which was inaugurated for the football field in the fall of 2010, it became apparent that there was no organized, non-commercial alumni group through which contacts could be made. Out of that experience, in the summer of 2011 a group of dedicated alums and friends of the school began the creation of the North Salem Viking Alumni and Friends Association to support our great school. A mission statement and by-laws were drawn up and 501(c)3 non-profit status was applied for. A nine-member Board of Directors was formed with staggered 3-year terms (each year a new third of the Board is voted upon). Committees have been formed, all of which may have non-Board members. The Viking Association is a work-in-progress and welcomes ideas for improvement. 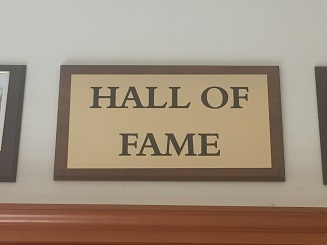 North Salem High School Hall of Fame was created to honor those individuals or groups whose actions or achievements in their chosen fields bring honor and distinction to the heritage of North Salem High School.